Mass customization has officially moved into the world of athletic shoes and sneakers. Two companies, Nike and Puma, each throw their hats into the mass customization ring with varying levels of success. Each company has a unique website that offer customers two very different experiences. One company tries to go the slick high tech route, while the other tries to wrap their products in a kitschy fictional world. We’ll start by taking a look at Nike, and their efforts with the NIKEiD program. Out of the two companies, I think that Nike has the most success with their website and customization program. Nike, which I assume has a larger budget then Puma, decided to use the slick high tech route, and the extra money definitely shows in the final product. Nike’s website offers a high level of functionality and ease of use for the final consumer. Because of this, among other parts, Nike customers will want to spend large amounts of time on the website, customizing a bevy of Nike products to purchase and to show off to friends. On a basic level, Nike offers everything that it probably should, and shows why it is one of the top athletic apparel companies in the world. First and foremost, Nike offers customers a plethora of products that they can either customize, or order pre-designed versions, like shoes in college team colors. The website itself is smooth, flashy, and minimizes downtime between screens. This, like the customization options, gives users a reason to stay on the site. If there were large amounts of downtime, for example, users would most likely navigate away from the page before getting the chance to immerse themselves in the site. Nike’s customization process itself is very user intuitive, and simple to do. Users can pick from a variety of basic shoe styles to start out with, and then customize with different colors and custom logo placement. 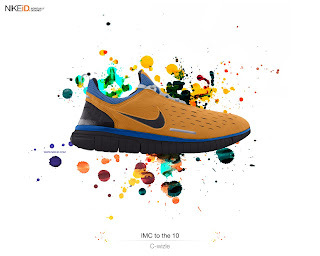 Once the shoe is finished, the user can either buy the shoe, or use the design as a custom desktop wallpaper, save it to a personal locker (sign-up for nike ID required), or send the design to a friend. In this way, Nike implements touches of buzz and viral elements. You create a cool shoe, send it to a friend, and hopefully, the friend makes their own shoe, and sends that on to someone else. The concept isn’t essential to the success of the idea, but it’s a nice touch that shows the level of thought and consideration employed by Nike. Also within the NIKEiD site is the option to customize products other then shoes, such as workout gear, shirts, and gym bags. This provides the consumer with not only a more diverse product lineup, but the opportunity to turn a 100$ shoe purchase into a 200$ shoe, bag and shirt purchase. Taking a look at Puma, we see a site that has a high level of creativity, and clearly wants to provide consumers with a clever, engaging shopping experience, but because of several issues, ultimately falls short of that goal. The concept is pretty simple, take the experience of a Mongolian BBQ restaurant, (I’ve never been to one, but judging by the site, you get to choose all the ingredients that go into your meal) and apply it to shoe customization. This is the first problem I have with this idea. What exactly does a Mongolian BBQ have to do with shoes? Beyond the obvious customization link, I don’t think the idea works too well. The second issue, is that Puma gives the consumer too many options, and not in the right areas. The great part about the Nike site is that a consumer was able to select from a slate of blank shoe designs. Puma gives you two designs, and that’s for men and women alike. Personally, if I’m going to shell out the money for a custom shoe, there better be no one else with even a similar design. Once you get into the customization process, Puma gives you about 20 different places where you can add a custom color or design pattern, so the design process can take a substantial amount of time to complete. It doesn’t help that during the customization process, it is difficult to get an idea of what the shoe looks like, since each piece is laid flat on an animated lunch tray. The site itself is also very slow. This results in choppy graphics, and a tedious customer experience. I do not know why anyone would want to spend any significant amount of time on this website. Where the site has the right idea, however, is within its express design option. Here, like Nike, users can easily see how the shoe design is taking shape, and the design decisions are easier to make and use a more intuitive interface. Between the two sites, Nike is the hands down winner. Nike does the best job of making technology work for them and their consumer. They have a flashy site that encourages consumers to spend time there. They also make the customization process easy and fun. Just about everything one could possibly desire from a customization website, Nike has. Let's face it. 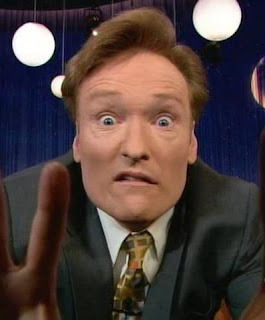 Conan O'Brien is an amazing entertainer. For those of you who don't watch the show regularly (I'm one of them), Conan has been running his show without writers due to the ongoing writers strike. Somehow, without the writers at his side, Conan and crew are able to come up with fresh and original content for the show. I mean c'mon, on a recent show he made spinning a wedding ring on a table for 2 minutes entertaining. The man is a comic genius. If you haven't been watching the show lately, tune in. It's probably some of the best work he's ever done.